I have this idea that's been drifitng across my neurons and it is hard to articulate. So I guess in the end it is best just to write it down without consideration of form and continuity. It has to deal with this intelligent design( ID for short ) thesis that is emerging since the attempt to sell creation science is turning to an abysmal failure and rightly so. Personally I am an evolutionist as it seems to be the most plausible explanation for how life on this planet adapted to the changing environmental conditions. However, how life got here in the first place or for that matter how this universe got here are entirely different matters. Creationist theories deal with how it all got made; evolutionist theories deal with how it all managed to stay. "The theory of intelligent design (ID) holds that certain features of the universe and of living things are best explained by an intelligent cause rather than an undirected process such as natural selection. ID is thus a scientific disagreement with the core claim of evolutionary theory that the apparent design of living systems is an illusion." This particular quote, by happenstance, brings me exactly where I wanted to go with my suggestion that the nature of this theory is exactly what it accuses evolution of being... an illusion. Happy accidents do happen. Right conclusion, wrong approach. Now to the gist of the argument. The human senses cannot be trusted. Our brains operate in a world of seeming chaos and from this the brain attempts to create order and it does so beyond our conscious capacity to control it. We know consciously that a pencil in a glass of water is not really bent but there is nothing we can do to tell our brain to quit interpreting the visual input as a bent object. So it is with many other observations in our world. 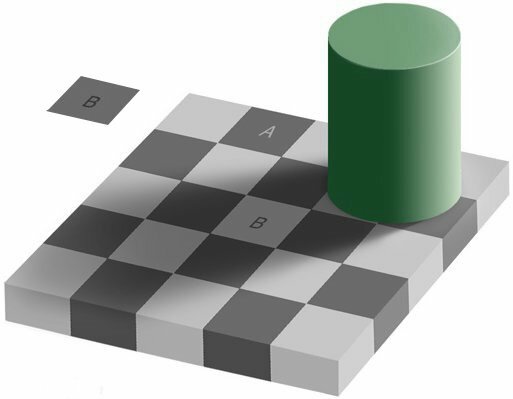 Here is a classic visual illusion: Look at the checkerboard. Is square A the same color as square B? for more visual illusions and brain manipulation. In a nutshell, we see intelligence in the order of the world because we are intelligent beings. Our brains induce intelligence into our every interpretation of the world around us and cannot perceive it in any other way than designed. So this theory of ID may be accurate in the conclusion that there seems to a unviversal design but its faulty reasoning is that this necessarily excludes the evolution of living things. It could be that evolution is part of that design since the key tenet of the theory of evolution is adapatation to a changing environment which is something we all see and do every minute of our lives.